PokerRules.net is your #1 resource for learning how to play poker! We have explained the poker rules for dozens of games, including all of your favorites like Texas Hold'em and Omaha, as well as some rarities like Anaconda and Trees. We recommend browsing around the site to find the poker rules you would like to learn. Almost every poker game, including the games played at the top poker sites USA, are based off of one of the four above games, so by learning those four games you will be able to pick up any other game relatively quickly. 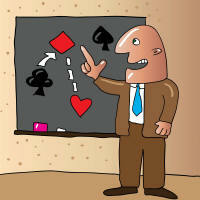 Or, you can browse our entire list of poker rules to see every poker game we explain on our site. Join Ignition Poker and receive up to $1000 free on your first deposit. Ignition Poker accepts all USA players and is the #1 rated poker room accepting Visa, Mastercard & Bitcoin! Draw poker games typically involve dealing each player a hand of cards, then allowing them to exchange some of their original cards for new ones. Some games allow only one draw, while others allow three or even more. Draw games are often slow compared to community games, but they are very traditional and still have a large player base. Stud poker games deal each player a hand of cards, and whoever has the best hand wins. There is usually a round of betting as each card is dealt out, so in total, there are often three to five rounds of betting depending on how the game is structured. Stud poker games are usually pretty slow compared to community games or even draw games. Community poker games are the most popular games in the world right now. Community games are fast paced and often build up huge pots. Each player receives hole cards which they can use along with community cards placed face up on the table. Community poker games include Texas Hold'em and Omaha poker. Wild card poker games take normal games and spice them up by adding one or more wild cards. This helps increase big pots and makes for explosive poker sessions. We recommend wild card games for players who are looking for excitement and thrill. Old timers are better off sticking with Stud or Draw games so they can keep up. There are quite a few other games that don't exactly fit into any of our other categories, so we compiled them all into this section. These games include oddball games like Guts, which hardly resembles any other poker rules, and Strip Poker, which is just what the name implies. Head over to this section to learn more. If you are still looking for more poker rules and game guides, make sure to check out these other poker rules websites.